The latest trailer for Captain America: The Winter Soldier is upon us and after going through the footage and digesting everything, I’m here to show you a few things that you may have missed from the trailer. Keep in mind some of these things contain SPOILERS so keep that in mind. But first off, let’s take a look at one cameo that we didn’t see from the US trailer. Left out of the US trailer is our first look at the beautiful Emily VanCamp as Agent Sharon Carter. Who is Agent Carter you ask? Well, for one, she is Peggy Carter’s niece and also Cap’s girlfriend from time to time. Whether she’ll be a love interest in The Winter Soldier remains to be seen but it’s nice to see good ol’ Agent 13 in the Marvel Cinematic Universe. It turns out that Ed Brubaker, the writer responsible for creating the Winter Soldier and writing the story on which the film is based off of, has a Stan Lee-style cameo in the film. Looking closely at the trailer for Captain America: The Winter Soldier you might glance over this no name scientist that’s attending to The Winter Soldier. As it turns out this nobody is actually Ed Brubaker. A fitting cameo, as he’s playing a scientist helping to build the Winter Soldier, his own creation. 2. Did S.H.I.E.L.D. create The Winter Soldier? Those of us who have read Brubaker’s Winter Soldier story arc should know that S.H.I.E.L.D. wasn’t the one responsible for creating Winter Soldier. He was created by General Vasily Karpov and reprogrammed to become an assassin for the Soviets, hence Winter Soldier. So why do we think that S.H.I.E.L.D. will be responsible for Winter Soldier’s creation? If you take a look at the image above, you can see a S.H.I.E.L.D. logo on the arm of the armed guard. Now, if you compare the background of the image above with the Ed Brubaker cameo image you can see that they are essentially the same background. Put it together and you can come up with a compelling case that S.H.I.E.L.D. will be responsible for The Winter Soldier. The question you have to ask yourself is: why was Winter Soldier created by S.H.I.E.L.D. in the first place? Are you ready for some helicarrier vs. helicarrier action? I hope so because that’s what you’re going to get in The Winter Soldier. First introduced in the MCU in The Avengers, the helicarrier is a sight to behold in the air. This time we get to see what happens when a hijacked helicarrier goes up against S.H.I.E.L.D.’s battalion of helicarriers. 4. Who the [email protected]#$ died?! Okay, this is something you might not have missed but it is something worth speculating about. Just who is that person underneath the sheet? The most popular opinion is that the person who died is Nick Fury. Nick Fury is not likely, as the person underneath is not as bloated as Jackson and has a much different facial structure as well. It won’t be Falcon either as Anthony Mackie has said that he has signed on to play Sam Wilson in multiple films. That leaves us with either Alexander Pierce (Robert Redford) or Winter Soldier taking that dirt nap. If you analyze the facial structure of the person, you’ll see similarities between the person underneath and Robert Redford’s facial structure. Besides, if it was Winter Soldier who died, shouldn’t it be Cap that is more distraught and not Widow? Those of you who have read the comics know who the Winter Soldier’s real identity is. Those of you who never read the comics should figure out who Winter Soldier is just by looking at the eyes of the Winter Soldier above. You can see distraught and sadness in those eyes right before he slings Cap’s shield back at him. Haven’t figured it out yet? The Winter Soldier is actually Bucky Barnes, Cap’s best friend. That’s why you see pain and distraught in his eyes as he knows he’s going to take on his own best friend. At this point the question is, is he free from his brainwashing or is Bucky unaware of Cap’s existence in modern times until now. So many questions resulted from just that one scene. I can’t wait to see Cap’s face when he finds out the identity of the Winter Soldier. This is why Captain America: The Winter Soldier is poised to be one of the best Marvel films to date. It has mystery, political intrigue, drama and lots of exhilarating action scenes all in one film. Color me excited. 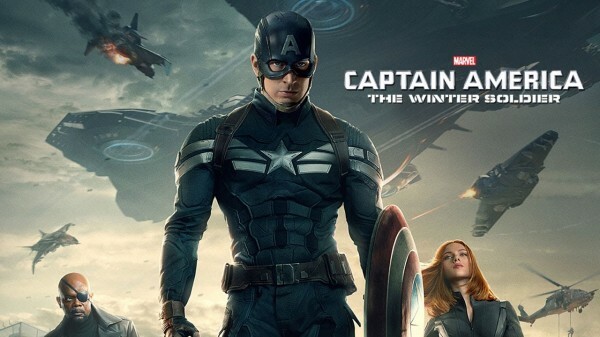 Captain America: The Winter Soldier shield slashes into theaters on April 4th.